The nation whose "Jasmine Revolution" launched the Arab Spring in the Middle East is holding its first free national elections today. The nation whose "Jasmine Revolution" launched the Arab Spring in the Middle East is holding its first free national elections. The polls come less than a year after a desperate produce vendor torched himself in a marketplace as a last act of protest against a government that wouldn't allow him to make a living. The living flames of his body ignited a blaze that tore through the entire Middle East, echoing and magnifying similar cries of economic rage all across the region. 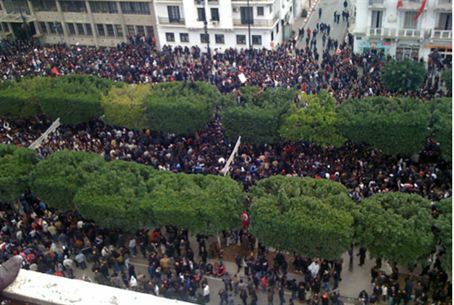 The result: governments toppled and dictators ousted in Tunisia, Egypt and as of last week, Libya as well. The 42-year reign of Muammar Qaddafi finally ended with the ignominous and violent death of Tripoli's charismatic, comic, and lethal madman in a blaze of gunfire and blood in his hometown of Sirte. Other governments have been threatened as well, as longtime rulers battle for their seats in Yemen, Syria. Promised reforms have, for the most part, minimized but not entirely suffocated similar upheavals in Saudi Arabia, Jordan, Bahrain, Oman and Morocco. In Tunisia, meanwhile, the parliament's 217 seats are expected to be split among the country's three largest parties, although many are running, including a number of secular parties and one associated with the Muslim Brotherhood. Women's rights are considered a strong issue, as are others in the country that has until now managed to balance its Islamic heritage with its respect for other cultures. A heavy turnout is expected from the 10 million-strong population. The election will result in a constituent assembly that will write a new constitution for the country to form the nation's laws. Islamists are expected to rise in the current election, although it is unclear just how big a win they will see -- and unclear as to which Islamists will rise. Although 117 parties are registered to run in the race, only 80 are actually participating -- and of those, only a handful are expected to win any seats, according to the Associated Press. The Hizb Ennahda (Renaissance Party), repeatedly suppressed by previous Tunisian rulers, now appears to be the best organized of all the parties. It claims to promote a "moderate" form of Islam that does not clash with progressive ideals such as women's rights, and supports a parliamentary system of government. It is expected that Hizb Ennahda will take up to 20 percent of the votes. The Progressive Democratic Party, second in popularity, is led by a woman, Maya Jribi, and is considered center-left. Polls taken just prior to elections indicated the PDP could take at least 10 percent of the mandates in Sunday's election. The Ettakatol (Democratic Forum for Labor and Freedoms), led by Mustapha Ben Ja'afar, a medical doctor, is also a center-left party. It is popular with the youth and with intellectuals and also appears that it may garner about 10 percent of the popular vote. The Congress for the Republic, founded by human rights activist Moncef Marzouki in 2001, has expressed its willingness to form a coalition with Ennahda. The party focuses its platform on respect for human rights and a strong separation of government powers from those of the individual. Other parties, including several with members of the former ruling administration of President Zine El Abidine Ben Ali, are also running.